Identification: On the small side for blackbirds – 6 to 8 inches – Brown-headed Cowbirds are sexually dimorphic. The males are a shiny black with brown heads while the females are more brownish gray all over. The birds have somewhat rounded tails and pointed, long wings. According to The Sibley Guide to Birds, there are a couple of similar looking species: the Shiny Cowbird (Moluthrus bonariensis) is similar in appearance, but with a longer tail and more rounded wings, and the Bronzed Cowbird (Moluthrus aeneus) is stockier, with a longer, heavier bill. 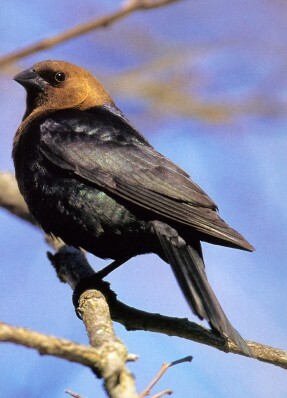 Neither the Shiny Cowbird nor the Bronzed Cowbird have the kind of expansive range of the Brown-headed Cowbird. Site and Date of Introduction: These birds are a classic example of homegrown exotics. They weren’t introduced from another country or region of the world, nor is there one site of introduction. Instead, as Europeans spread out across the North American continent, so did the cowbirds. Mode(s) of Introduction: Native to the United States, Brown-headed Cowbirds aren’t native to many of the regions in which they now live: including habitats as varied as the Northeast and the Sierra Nevada. Their introduction into these areas followed the eradication of forests and the spread of livestock in these regions, and happened over a number of years as farming, clearcutting, suburban sprawl and other man-made habitat changes occurred across the country. The birds used to follow herds of bison across the Great Plains, eating the insects that the bison’s hooves turned up and leaving their eggs in the nests of other birds so that the cowbirds could move on with the bison and still have chicks raised to adulthood (by the nest-building birds). Reason(s) Why it has Become Established: Brown-headed Cowbirds seem to be remarkably hearty and adaptable birds. They were able to adapt from frequenting bison habitat to locating near domestic livestock and spread with livestock across the country, practicing brood parasitism wherever they went. Ecological Role: Brood parasites do not build their own nests. Instead, the females lay eggs in the nests of other bird species, and then leave those eggs for the host birds to raise as their own. This style of parasitism served them well when they inhabited only their native Great Plains, as it apparently enabled them to follow along with the roaming bison herds, leaving their potential offspring under the care of others. And the parasitism seems to serve them well in their newer, invasive role. The Cornell Ornithology Laboratory estimates that, while over 100 different species have been host to cowbird parasitism, Yellow Warblers, Song Sparrows, Red-eyed Vireos, Chipping Sparrows, Eastern Phoebes, Eastern Towhees, Ovenbirds, and Common Yellowthroats are the most commonly targeted host species. Benefit(s): I’m not really sure about potential benefits from Brown-headed Cowbirds. Perhaps there’s an argument that a certain amount of brood parasitism helps keep any one songbird population from skyrocketing too high, but that’s just speculation. The cowbirds have spread with spread of grain storage facilities and the like, but one probably should not argue that they help keep excess grain under control! Threat(s): While some have blamed the Brown-headed Cowbirds for a national decline in the number of songbirds, more legitimate concerns about the birds’ negative impact on songbird biodiversity seem to focus on regional issues. In Texas there is concern about cowbird parasitism affecting the endangered Black-capped Vireo, and in the Sierra Nevada there is concern about cowbird parasitism affecting populations of certain species of flycatchers and vireos. Control Level Diagnosis: The scientific and birdwatching community is somewhat divided on Brown-headed Cowbirds and their impact – some argue that their nest parasitism poses a major threat to other songbirds, particularly endangered species such as Black-capped Vireos. Others, like the authors of a 1997 Audubon paper on Brown-headed Cowbirds, argue that reports of their threat to local species are greatly exaggerated, and even that Brown-headed Cowbirds actually saw a population drop in the mid-1990s. Others point out that brood parasites have such a bad reputation that it is difficult to assess their actual impact. Control Method: Attempts to control cowbird populations have centered on shooting adult birds at roosting sites or otherwise trapping/killing the adult birds and removing eggs from the nests they’ve parasitized.